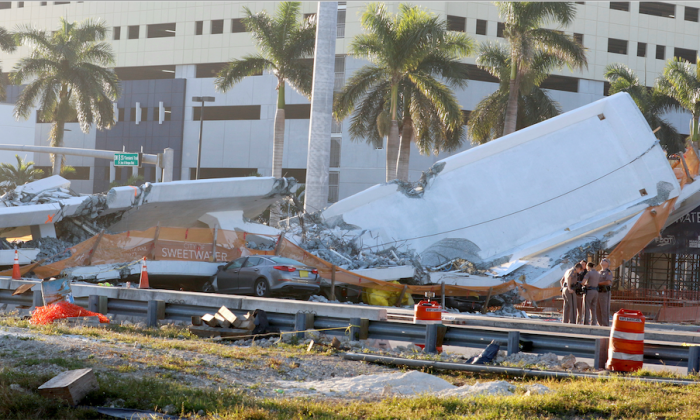 Two of the companies involved in the construction of the recently collapsed FIU footbridge in Florida faced allegations of unsafe practices, the Miami New Times reported. The New Times wrote that Munilla Construction Management, a South Florida firm, was one of the firms involved in building FIU’s bridge, while another was Figg Bridge Group, from Tallahassee. Munilla faced a civil suit brought forward by a TSA employee who reportedly suffered an injury at a section of the Fort Lauderdale-Hollywood International Airport that was under construction, the news service reported. This is the statement in its entirety, according to the New Times. In regard to the incident at Fort Lauderdale Hollywood International Airport that is being reported on, we want to make it clear that there is no bridge, or temporary bridge, at this project. This was simply a trip and fall accident that occurred on the ground floor involving a piece of plywood that was covering a sidewalk under construction. To report that this is in any way similar to the tragic accident involving the FIU pedestrian bridge is simply wrong and irresponsible. Munilla also provided a photograph of the site, which shows a number of plywood boards covering up what appears to be a portion of the ground that had been dug up. “They built this makeshift bridge in the area where all the employees work, and it was poorly done. He fell and hurt himself really badly,” Allison told the New Times. A span of bridge put together by Figg in Virginia collapsed in 2012, before being put into service. Company workers were fitting a 90-ton concrete section of the South Norfolk Jordan Bridge when it fell 40 feet onto railroad tracks, the Virginian-Pilot reported. Four workers suffered injuries in the incident. “They were fortunate that the injuries were not more serious,” said Jay Withrow, director of the legal support division for the Department of Labor and Industry, according to the Virginian-Pilot. Following an investigation by the Virginia Department of Labor and Industry, Figg was fined $28,000 and cited for a number of infractions. The company had reportedly made unauthorized modifications to a girder used in construction and did not conduct regular inspections of the girder. It is also reported that Figg was cited for not having certain safety procedures in place, according to the Virginian-Pilot. A company representative responded to queries by the Virginian-Pilot with a written statement, saying that the violation had no bearing on the safety of the bridge. “The incident that occurred during construction was a construction equipment property damage issue that had nothing to do with the final bridge,” said W. Jay Rohleder, the company’s manager on the project. “We are just heartbroken,” the statement concludes. Figg expressed sympathies to the victims of the tragedy via the Fort Myers News-Press. Further, late on Friday, March 16, the Florida Department of Transportation (FDOT) released a transcript of a voice-mail message the agency said was left by Denney Pate, senior vice president and principal bridge engineer for Figg. In the video below is a transcript of that call. He did not immediately respond to email queries from Reuters seeking comment on the matter. At least six people were confirmed killed, and police have said more bodies may be recovered from the rubble. The accident occurred just five days after the 174-foot-long (53-meter) bridge, assembled by the side of the highway, was installed during a six-hour operation.